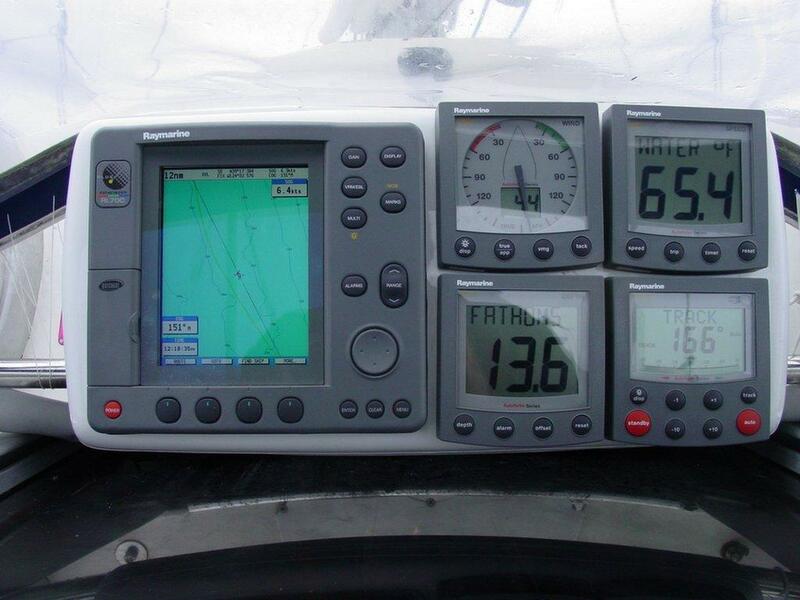 Chartplotter / Radar (left) shows GPS position on an electronic chart, radar images, speed over ground, course over ground and a bunch of other information. Wind instrument (middle top) shows wind direction, speed true or apparent and maximum wind speed. Boat speed (top right) shows boat speed through the water, water temperature and distance traveled through the water. Depth (middle bottom) shows depth of the water below the keel measured in Fathoms (6 feet in a fathom). Autopilot controller (bottom right) a digital compass shows course steered and allows changes to course. A duplicate Chartplotter is located below at the navigation station as well as a repeater that shows all the information from any other instrument..